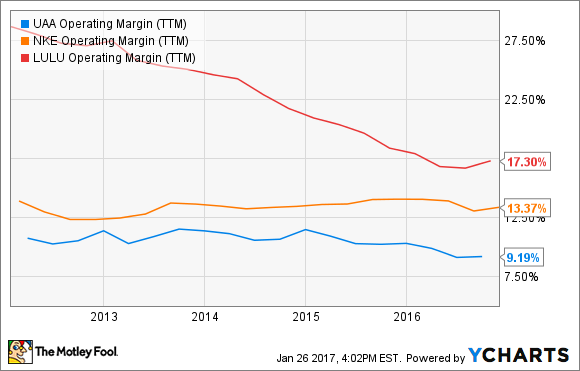 Will 2017 Be Under Armour Inc's Worst Year Yet? The sports-apparel brand enters 2017 on a downward trend. Here's why investors shouldn't get their hopes up for a recovery. Under Armour (NYSE:UA) (NYSE:UAA) has shown some surprising signs of fatigue lately. The one-time stock market darling had its first losing year since the recession in 2016 as the stock fell 28%. It came under valuation pressure in 2015, then plummeted when management scaled back 2018 guidance last October. A pair of Under Armour sneakers. Image source: Motley Fool. At its 2015 Investor Day conference, the company announced goals of $7.5 billion in revenue and $800 million in operating income by 2018. But on its latest earnings call in October, management slashed that operating income guidance, saying it would reach just about $600 million in 2018 as the company invested to "get big, fast." Under Armour's revenue growth has been superb over the years. The company posted its 26th consecutive quarter of 20% or greater growth, though it was a given that maintaining that growth rate would get more difficult, which is why the company had to sacrifice on the bottom line. Although it sees revenue growth in the low 20% range over the next two years, it expects operating income to grow by just the mid-teens. Profitability has long been a problem for Under Armour. The company is heavily reliant on retail partners, enough so that it lowered its guidance when The Sporting Authority declared bankruptcy, and its operating margin has long trailed behind rivals like Nike (NYSE:NKE) and Lululemon. Despite Under Armour's popularity, it lacks the pricing power of Nike or Lululemon, and with its latest guidance, that operating margin is expected to fall to 8% by 2018. Considering Under Armour just significantly lowered its profit guidance for the next two years, investor expectations for 2017 should be muted as the company will be investing in the brand. With Under Armour stock still trading at a pricey P/E ratio of 65, the company will have to significantly outperform that guidance in order to drive the stock higher, as shares are arguably still overvalued even after the recent drop. Among those key areas of investments are footwear, direct-to-consumer, international, and sports fashion and lifestyle. In the recent earnings call, management noted that the growth in the North American apparel market was slowing down generally, so the company was choosing to focus on growth opportunities like footwear and international, which require more investment. The loss of several sporting goods retailers to bankruptcy also hurts its distribution. CEO Kevin Plank also noted that sponsorship deals are going for a longer period of time -- the company just signed a deal with UCLA for 15 years -- which takes a greater level of investment and makes it incumbent upon the company to act now. Investors should expect Under Armour to continue to innovate. The company unveiled new products at the Consumer Electronics Show (CES) in Las Vegas earlier this month, including Athlete Recover Sleepwear and a new line of run-tracking shoes. Plank made it clear that the company isn't slowing down, but investors should expect the stock's performance to be modest over the next two years. Nike has also seen sales growth slow recently as Adidas has been ascendant, and brick-and-mortar retail in general is struggling. Under Armour stock's performance will ultimately depend on how it does relative to its 2018 guidance. With its pricey valuation, however, the stock is still primed to get punished if growth disappoints. 2017 probably won't be worse than last year's 28% drop, but with significant investment planned, investors can't expect the blockbuster growth they saw from the stock in the earlier part of the decade. Expect to learn more when the company reports fourth-quarter earnings on January 31.